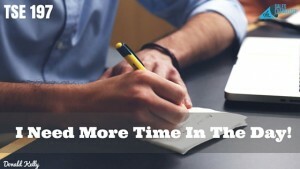 Home » TSE Podcast Post Page » TSE 197: I Need More Time In The Day! Put them in your schedule at a specific time when they are most meaningful to accomplish. These are some very simple practices, but the majority of people are not doing them and thus find themselves constantly running out of time and not being able to do all that they need to do. This process is something that has helped me and I know it will help you too. Try it for yourself. As always, I want you to be successful. I want you to go out and do BIG THINGS!